1. Set aside 6 x 150-200ml cups or ramekins. If you plan to turn the creams out, very lightly oil the insides. Put the cream in a saucepan with the crushed cardamom pods. Over a low heat, very gently allow the cream to come almost to boiling point. Remove from the heat, cover the surface with cling film and set aside to cool. 2. Add the gelatine to a bowl of cold water; set aside. Put 300g blackberries and the sugar in a separate saucepan with 2 tbsp water. Put over a low-medium heat and cook, stirring, for about 6 minutes, until the berries have become a sauce. 3. 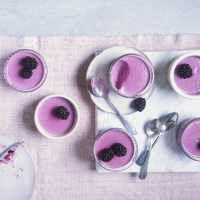 Whizz the blackberry sauce in a blender until smooth. Pass through a sieve and return to the pan. (Don’t clean the sieve afterwards; any remaining sauce will flavour the cream later.) Add the squeezed-out gelatine leaves and put over a very low heat, stirring, to dissolve the gelatine, then cool. Pour the cream through the sieve to remove the cardamom. When both mixtures have cooled, stir them together. Divide between the cups or ramekins and chill for at least 4 hours or up to 48 hours. Turn out or serve in the cups, with the remaining 300g blackberries scattered over.